Reporters Without Borders (RSF) has learned that Sasan Aghai, the deputy editor of the newspaper Etemad, was freed yesterday and that Yaghma Fashkhami, a reporter for the news website Dideban e Iran, was freed today. Arrested at their respective workplaces in August by plainclothesmen from the justice department’s intelligence protection section, they were released on bail pending trial after more than 100 days of solitary confinement in Section 241 of Tehran's Evin prison. Aghai was arrested on 11 August, Fashkhami on 21 August. Reporters Without Borders (RSF) has learned that Mohammad Hossien Hidari, the editor of the Dolat e Baharnews website, was released on bail of 100 million toman (90,000 euros) on 29 November pending trial. Reporters Without Borders (RSF) condemns last week’s arrest of Mohammad Hossien Hidari, the editor of Dolat e Bahar, a news website that supports former President Mahmoud Ahmadinejad’s political faction. Arrested on 21 November after being summoned by the Tehran prosecutor’s office for culture and media, Hidari is accused inter alia of covering a speech by the controversial former president that was very critical of the judicial system. The Tehran prosecutor blocked Hidari’s proposed release on 100 million toman (90,000 euros) in bail. Access to the website has meanwhile been blocked since the start of November as a power struggle intensifies between the Ahmadinejad faction and those allied with Supreme Leader Ali Khamenei. Several former Ahmadinejad administration officials are currently the targets of judicial proceedings on corruption charges. Former Tehran prosecutor Said Mortazavi has been given a two-year jail sentence but not in connection with his many crimes against journalists. Mortazavi has been jailed for complicity in the murder of Mohsen Roholamini, one of three people who died as a result of mistreatment in Kahrizak detention centre following their arrest on 12 June 2009 for their role in protests against then President Mahmoud Ahmadinejad’s disputed reelection. Roholamini was the son of a government dignitary. The other two were Amir Javadifar and Mohammad Kamarani. Acquitted at the original trial, Mortazavi was convicted when the case came before a Tehran appeal court. Reporters Without Borders (RSF) has been denouncing Mortazavi’s role in crimes against journalists and citizen-journalists for the past 17 years. He still needs to be tried for his involvement in the deaths of two journalists in Tehran’s Evin prison. One was Zahra Kazemi, a photographer with Iranian and Canadian dual citizenship who died in July 2003. The other was Omidreza Mirsayafi, a blogger who died in suspicious circumstances in March 2009. RSF believes that Mortazavi also shares responsibility for the arrests and convictions of hundreds of journalists and citizen-journalists, for the mistreatment and even torture they underwent while detained, and for the closure of around 100 newspapers while he was prosecutor. Reporters Without Borders (RSF) has learned that Ehssan Mazndarani, the editor of the daily newspaper Farhikhteghan, was released on 31 October on completing a two-year jail sentence, during which he was hospitalized several times with heart and lung problems after going on hunger strike for more than three weeks. One of the victims of a wave of arrests in November 2015, he was originally given a seven- year jail sentence that was reduced to two years on appeal. RSF has also learned that Mokeryan news website journalist Bakhtyar Khoshnam was released yesterday on bail of 137 million toman (110,000 euros). He was arrested on 28 September. Reporters Without Borders (RSF) condemns the international travel ban that has been imposed on Issa Saharkhiz, a journalist who used to edit several now-closed reformist newspapers. Officials stopped him on the tarmac of Tehran international airport as he was about to board a flight to Berlin on 17 October and confiscated his passport under article 16 of the passport law. Saharkhiz accuses the authorities of harassing him. Article 16 allows the judicial authorities to withdraw the passports of “persons whose travel would be contrary to the Islamic Republic’s interests.” One of the victims of a wave of arrests in November 2015, Saharkhiz had obtained a passport without any difficulty shortly after his release from prison in April of this year. Reporters Without Borders (RSF) condemns the one-year prison sentence that a Tehran revolutionary court passed on 30 September on Souroush Farhadian, a contributor to several pro-reform newspapers and editor of the bimonthly Ro Beh Ro (Opposite). His lawyer, Saleh Nikbakht, said it was the second time he has been tried and convicted for the same articles. He has appealed. Farhadian’s ordeal began on 15 May 2016, when he arrested in the central city of Arak on charges of anti-government publicity and “activities threatening national security” as a result of a complaint by the local military. After being freed on bail the next day, he was sentenced on 23 September 2016 to seven years in prison but an Arak appeal court later reduced the sentence to a fine. In both cases, he was convicted over the same articles denouncing the illegality of the detention of Mir Hossein Mousavi, a former prime minister and owner of the now closed newspaper Kalameh Sabaz, Zahra Rahnavard, a writer who is his wife, and Mehdi Karoubi, a former parliamentary speaker and owner of the now closed newspaper Etemad Melli. Reporters Without Borders (RSF) condemns the suspension of the reformist daily newspaper Mostaghel (Independent) by the Tehran prosecutor’s office for culture and media since 5 October. According to Mostaghel’s editor, Ali Nazari, it was suspended for publishing former Prime Minister Mir Hossein Mousavi’s photo. This apparently violated an order by the High Council for National Security and Justice banning any information in the media about the leaders of the protests against former President Mahmoud Ahmadinejad’s disputed reelection in June 2009. 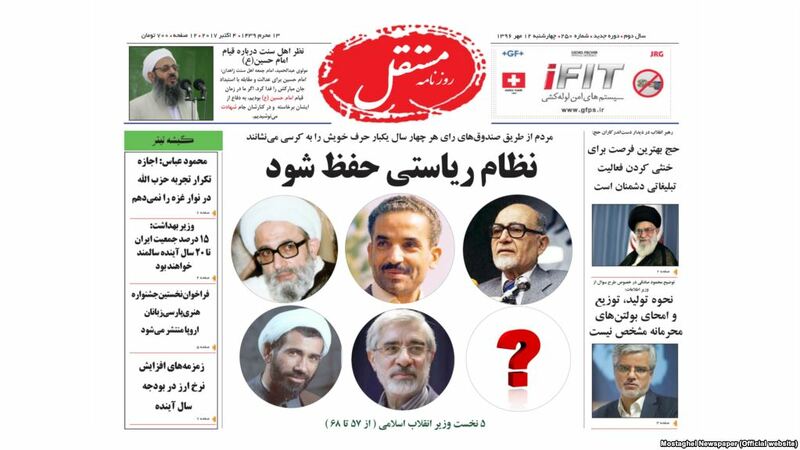 On 4 October, the newspaper published the photos of Iran’s five prime ministers from 1979 to 1989 (including Mousavi’s) to illustrate an article about the possibility of a return to a parliamentary system. The owner of the now closed newspaper Kalameh Sabaz, Mousavi was prime minister from 1981 to 1989 and ran against Ahmadinejad in the 2009 presidential election. He, his wife (the writer Zahra Rahnavard), and Mehdi Karoubi, a former parliamentary speaker and owner of the now closed newspaper Etemad Melli, have been kept illegally under house arrest and deprived of all their rights since 24 February 2011. Reporters Without Borders (RSF) has learned that Mehdi Khazali, an outspoken blogger who was arrested on a Tehran street by plainclothesmen on 12 August, was freed on 28 September. The editor of the Baran blog, he had been openly critical of the head of the judicial authority in the months prior to his arrest. Arrested many times in the past, he was sentenced to 14 years in prison in 2011. The conditions of his latest release have not been revealed. He is the son of Ayatollah Abolghasem Khazali, an influential conservative cleric and regime member for 37 years. Reporters Without Borders (RSF) condemns a judicial decision to extend the provisional detention of two journalists – Sasan Aghai, the deputy editor of the newspaper Etemad and Yaghma Fashkhami, a reporter for the news website Dideban e Iran – by another month in violation of both Iranian law and international standards. They are also being denied the right to see a lawyer and to be visited by their families. Both were arrested last month at their workplace by plainclothesmen from the justice department’s intelligence protection section – Aghai on 11 August and Fashkhami on 21 August. The authorities have still not said why they were arrested or where they are being held. Reporters Without Borders (RSF) is pleased to learn that Khosro Kurdpour, a Kurdish journalist who edited the Mokeryan news website in the northwestern city of Mahabad, was released on 8 September on completing a sentence of five-year in prison. Ministry of intelligence officials arrested him at his home in Mahabad on 7 March 2013, one day before summoning and then arresting his brother, Masoud Kurdpour, who contributed to the website. The Mahabad revolutionary court that sentenced them both on 9 November 2013 gave Masoud Kurdpour a three and a half years jail term. 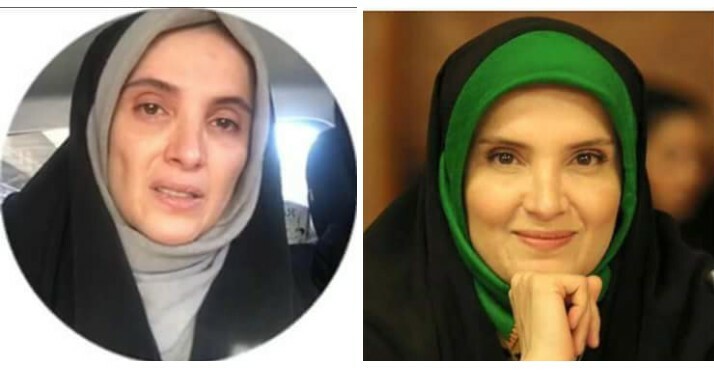 Reporters Without Borders (RSF) is relieved to learn that Hengameh Shahidi, a woman journalist who edited the Paineveste blog, and Zeniab Karimian, a woman journalist who hosted a programme on Iran’s 3rd TV channel, were both released provisionally yesterday on bail of 900 million toman (810,000 euros). Arrested on 9 March, Shahidi staged several hunger strikes in protest against her detention and prison conditions, despite being very ill. Karimian was arrested at her home on 23 January 2017 by intelligence ministry plainclothesmen. Both were held in isolation in different security sections of Tehran’s Evin prison, initially under the intelligence ministry’s control and then under the control of the justice department’s intelligence section. When Shahidi emerged from the prison, she appeared weak and had clearly lost a lot of weight. Reporters Without Borders (RSF) condemns the arrest of Nastaran Naimi, the wife of the imprisoned citizen-journalist Soheil Arabi. Plainclothesmen arrested her at her home on 31 July after searching it. Her family has still not been told why she was arrested or where she is being held. Arabi has been detained for the past three and a half years. Arrested by Revolutionary Guards in December 2013, he was incarcerated in Security Section 2a of Tehran’s Evin prison, where he was isolated and mistreated for two months to get him to confess to helping to create a Facebook network that blasphemed Islam and criticized the government. The confession led to the imposition of a death sentence in August 2014, which ­– following protests by his lawyer and the intercession of UN special rapporteurs – was eventually overturned. At a retrial in September 2015, he was sentenced to seven and a half years in prison starting with two years under observation, during which time he must prove he has repented to avoid reimposition of the death sentence. Reporters Without Borders (RSF) has learned that four administrators of a group that used the instant messaging service Telegram to circulate information – Seid Mojtaba Bagheri, Said Naghdi, Javad Jamshidi and Nima Keshvari – were freed on bail of 500 million toman (410,000 euros) on 30 and 31 July. Held in Tehran’s Evin prison after their arrest by Revolutionary Guards on 16 March, they are due to be tried on 12 August. Two other members of the group who were arrested at the same time, Sobhan Jafari Tash and Ali Ahmadinia, will be freed as soon as their bail is paid, their lawyer, Ali Mojtahad Zadeh, said. RSF has also learned that the journalist and photographer Assal Esmaeilzadeh was freed on bail of 300 million toman (270,000 euros) on 13 July pending trial. She was arrested without charge at the behest of the Tehran prosecutor’s office for culture and media on 20 June. Reporters Without Borders (RSF) condemns the six-month jail sentence that was imposed on Issa Saharkhiz, the former editor of several, now-closed reformist newspapers, on 19 June, just two months after his release. His lawyer, Mahmoud Alizadeh-Tabatabaie, said he was convicted of insulting the head of the judicial system. One of the victims of a wave of arrests in early November 2015, Saharkhiz was sentenced by a Tehran revolutionary court in August 2016 to three years in prison on charges of anti-government propaganda and insulting Supreme Leader Ali Khamenei. His lawyer reported at the time that two other charges against Saharkhiz – publishing false news and insulting the head of the judicial system – would be tried separately as political crimes before a court of assizes. After the latest sentence was passed on 19 June, Alizadeh-Tabatabaie pointed out that the court had accepted that his client’s criticism of the head of the judicial system had been personal in nature. It therefore could not be regarded as a political crime meriting a six-month jail sentence, he added, announcing that they planned to appeal. Saharkhiz was released on 15 April after being deemed to have completed the first sentence. While held, he staged several hunger strikes in protest against his imprisonment and had been serving his sentence in a Tehran hospital since March 2016. Reporters Without Borders (RSF) has learned that, after payment of 300 million toman (270,000 euros) in bail, Borna News social affairs editor Tahereh Riahai was released provisionally on 24 June pending trial. Arrested by plainclothes intelligence officers on 27 December 2016, she had been kept in isolation in Section 209 of Tehran’s Evin prison for months. Reporters Without Borders (RSF) has learned that Abdol Reza Davari, former President Mahmoud Ahmadinejad’s onetime press adviser, who also once ran the newspaper Shahrvand and the government news agency Irna, was arrested on 31 May in order to serve a three-year jail sentence. Davari was convicted in September 2013 of “insulting” Supreme Leader AliKhamenei in three comments posted on Facebook and was given a six-year jail sentence that was reduced to three years on appeal. He was arrested two days after posting an open letter criticizing Ebrahim Raisi and Mostafa Pour Mohammadi, two members of a commission that passed death sentences in 1988 on thousands of political prisoners who refused to renounce their beliefs. Reporters Without Borders (RSF) is very concerned about the health of Narges Mohammadi, an imprisoned journalist and human rights defender who has been returned to prison just two days after undergoing an operation. Rushed to hospital with severe uterine bleeding on 28 May, Mohammadi was operated on the next day and was taken back to prison yesterday. Held since May 2015, Mohammadi was deemed to have completed an initial six-year sentence on 17 March and immediately began a second, ten-year one. She has several ailments including muscular paralysis but is being denied the medical care she needs. Her health is in danger and she should not be in prison. We call for her immediate release. Reporters Without Borders (RSF) has learned that Morad Saghafi, the editor of the magazine Goft o Gu (Dialogue in Persian), was released on payment of bail on 20 May pending trial. He had been arrested at his Tehran home on 16 March. journalist Hengameh Shahidi decided to suspend her hunger strike after receiving a visit from her family in 16 May and a promise from the Tehran prosecutor’s office that her appalling prison conditions will be improved and that she will be given complete medical examinations. According to her family, she is suffering from several heart and respiratory ailments, along with other conditions. She had not been eating any food since 10 May. Reporters Without Borders (RSF) is pleased to learn that Mohammad Sedegh Kabodvand, the editor of Payam-e mardom-e Kurdestan (a regional newspaper closed by the authorities in 2004), was granted a conditional release today on completing ten years in prison. Held since July 2007 in Tehran’s Evin prison, Kabodvand was sentenced to a total of 11 years in prison in connection with his journalistic activities and his creation of a human rights organization in Iranian Kurdistan, the northern region where he lived. He has been freed provisionally pending a judicial decision on the application of article 134 for the new Islamic criminal code to the rest of his sentence. Under a 2013 amendment to the code, a person convicted on several charges should serve only the most important sentence. By this token, he should have been freed four years ago. Reporters Without Borders (RSF) has learned that two imprisoned journalists, Kaivan Karimi and Issa Saharkhiz, have been released conditionally in the past week. Karimi, a young documentary filmmaker, was freed on 20 April after completing half of the one-year sentence he received in November 2016 . Saharkhiz, the editor of several reformist newspapers was released on 25 April. His lawyer, Mahmoud Alizadeh-Tabatabaie, said he had completed his sentence. One of the victims of a wave of arrests in early November 2015, Saharkhiz was sentenced by a Tehran revolutionary court in August 2016 to three years in prison on charges of anti-government propaganda and insulting Supreme Leader Ali Khamenei. While held, he staged several hunger strikes in protest against his imprisonment and had been hospitalized since March 2016. The sentence was reduced last September. Ranked 165th out of 180 countries in RSF’s 2017 World Press Freedom Index, Iran is one of the world’s five biggest prisons for media personnel, with a total of 28 journalists and citizen journalists detained. Reporters Without Borders (RSF) is outraged by the continuing persecution of journalist and leading human rights defender Narges Mohammadi, who has just started serving a ten-year prison sentence on completing a six-year one. She received the ten-year sentence a year after her most recent arrest, on 5 May 2015. Mohammadi has a long history of persecution by the judicial authorities and has been arrested several times. During her spells out of prison, she has worked closely with Nobel peace laureate Shirin Ebadi at the Centre for Human Rights Defenders. The six-year sentence followed her arrest at her home on the evening of 10 June 2010. She was convicted two months later on charges of “meeting and plotting against the Islamic Republic,” “anti-government publicity:” and “collaborating with the Centre for Human Rights Defenders” and was given an 11-year jail term that was reduced to six years on appeal in March 2011. Mohammadi suffered muscular paralysis as a consequence of the heavy-handed interrogation sessions to which she was subjected after her arrest in 2010. As a result, she was paroled in July 2012. Reporters Without Borders (RSF) yet again condemns the persecution of journalists in Iran after at least three more were arrested in the past week. The latest victims include Morad Saghafi, the editor of the magazine Goft o Gu (“Dialogue” in Persian), who was arrested at his Tehran home yesterday and was taken to an unknown location. His lawyer, Hamed Zargar, said neither he nor Saghafi’s family have been told why he was arrested. Meanwhile, Ali Motahari, the deputy speaker of Iran’s parliament, yesterday asked the minister of intelligence to explain why a military unit recently arrested 12 editors of pro-reform information pages on the instant messaging service Telegram. Motahari also criticized the detention of Ehssan Mazandarani, the former editor of the newspaper Farhikhteghan, on 12 March (see RSF’s 13 March release). His wife, Malieh Hossieni, a journalist with the newspaper Farhikhteghana, was fired the day after his arrest. Although banned, apps and social networks such as Telegram, Facebook and Twitter nowadays play an important role in providing Iranians with news and information. Telegram says it has more than 15 million users in Iran. According to the Kalameh news website, Ali Ahmadinia, the administrator of the Eslahat News (Reform News) channel on Telegram, was arrested on 14 March and was taken to an unknown location. RSF is currently very concerned about the health of two journalists who have been on hunger strike since their arrest. One is Mazandarani, who was arrested on 12 March (see above). The other Henghameh Shahidi, who was arrested on 9 March. Reporters Without Borders (RSF) condemns the six-month prison sentence that has been passed on Hossein Karoubi, the former editor of Etemad Meli (a newspaper closed since August 2009) for circulating the open letter that his father, Mehdi Karoubi, wrote to President Hassan Rohani. Etemad Melli’s owner and a former parliamentary speaker, Mehdi Karoubi has been under house arrest since February 2011, a fate he has shared with former Prime Minister Mir Hossein Mousavi (the owner of the closed newspaper Kalameh Sabaz) and Mousavi’s wife, the writer Zahra Rahnavard. Mousavi and Mehdi Karoubi, who are both former presidential candidates, are being held illegally and are being denied their rights. Their state of health is very worrying. RSF has meanwhile learned that Samna Safari, a journalist with the monthly Andisher Poya, was released on 11 March after the authorities determined that he had served his two-year jail sentence. Detained along with three other journalists in a wave of arrests in November 2015, he was sentenced by a revolutionary court in March 2016 to five years in prison for “anti-government propaganda activities.” This was reduced to two years on appeal. Reporters Without Borders (RSF) firmly condemns progressive cleric Ahmad Montazeri’s arrest yesterday. The editor of the website of his late father, Ayatollah Hossein Ali Montazeri, he was returned to prison after being summoned before a special court for clerics. He was prosecuted for posting an old recording on the website on 9 August 2016 in which his father could be heard criticizing the wave of executions of political prisoners in the 1980s. Reporters Without Borders (RSF) has learned that Ehssan Mazndarani – the editor of the newspaper Farhikhteghan and one of the victims of a wave of arrests in November 2015 – was released on 9 February. He had been given a seven-year jail sentence that was reduced to two years on appeal, His lawyer said he was freed as a result of a decision that he had completed his sentence. While in prison, he was hospitalized several times with heart and chest problems after a three-week hunger strike. Reporters Without Borders (RSF) is appalled to learn that Hossien Movahedi, a local news website reporter, was flogged last week in Najafabad, a city 450 km south of Tehran, for getting one of his facts wrong in a story about the confiscation of mopeds from female students at a technological secondary school in the city. Movahedi reported on the Najafabad News website on 14 June 2016 that the police seized 35 mopeds when, according to the police, it was only eight. Although he apologized for his mistake and although the police were allowed to publish their version on the website, the police pressed charges against him and a Najafabad court sentenced him to 40 lashes for “publishing false information.” This inhuman and medieval sentence was carried out on 4 January. Iran has yet to ratify the Convention against Torture and other Cruel, Inhuman or Degrading Treatment. Reporters Without Borders (RSF) has learned that Rihaneh Tabatabai, a journalist who has worked for several reformist newspapers, was released yesterday on completing a one-year jail term on charges of endangering national security and anti-government publicity. She was arrested on 12 January 2016 to begin serving the sentence, which was originally imposed in November 2014 and was confirmed by a Tehran appeal court a year later. The sentence also includes two-year ban on political and journalistic activity in the media and online following her release. In all, Tabatabai has been jailed four times since 2010 in connection with her journalistic activities.